"Through excellence in injury prevention research and translation, we support, challenge and engage citizens, communities, governments and industry to eliminate injury from all causes"
The Monash University Accident Research Centre (MUARC) is Australia's largest and most respected accident and injury prevention research organisation. Our research, consultancy, training and scientific expertise include safety in all modes of transport, in the workplace, in the community and in the home. Striving for excellence in our research and academic programs. Creating and supporting the next generation of injury prevention leaders and advocates. Engaging with governments, industry and community so they can make effective and accountable decisions to eliminate injury. Leading and advocating for robust evidence-based injury prevention policy and interventions that can be adopted across communities. Demonstrating a safe, supportive and inclusive workplace. Providing the best possible physical resources to support the MUARC research program. 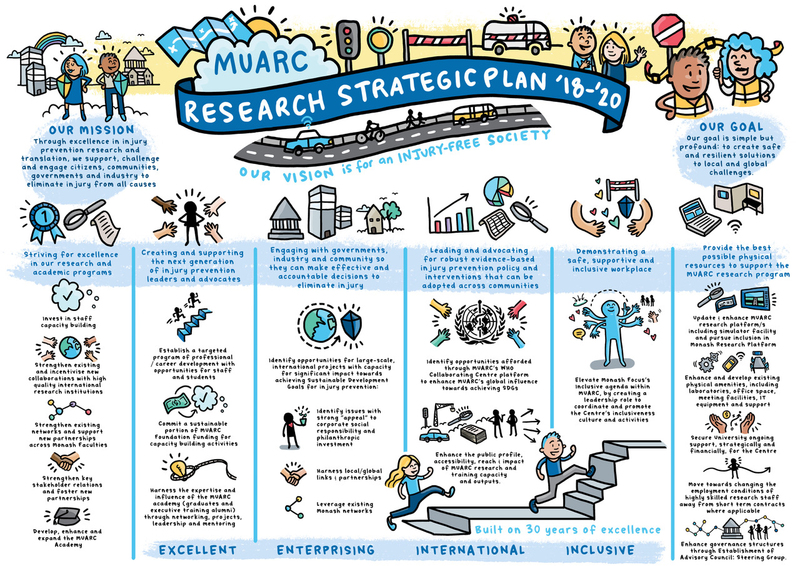 Our annual report aims to provide a record of MUARC's achievements and significant activities undertaken through the year.